Points Nécessaires : 180 Please note that, for now, you cannot download content from our platform directly onto a mobile device (phone, iPod, iPad, tablets...). You need to download your items onto a PC or Mac, and then transfer them onto your device in the normal way. We are working on allowing direct downloads to mobile devices but this is not possible in the current version of the platform. Sorry about the inconvenience! Read by Tyler Oakley! 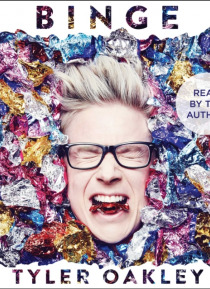 Pop culture phenomenon, social rights advocate, and the most prominent LGBTQ+ voice on YouTube, Tyler Oakley brings you his first collection of witty, personal, and hilarious essays written in the voice thats earned him more than twenty-one million followers across social media.For someone who made a career out of over-sharing on the Internet, Tyler Oakley has a shocking numb… er of personal mishaps and shenanigans to reveal in his first book: he experienced a legitimate rage blackout in a Cheesecake Factory; he had a fashion stand-off with the White House Secret Service; he crashed a car in front of his entire high school in an Arbys uniform; he projectile vomited while bartering with a grandmother. With millions of fans clamoring for more Tyler Oakley, he delivers his best untold, hilariously side-splitting moments with trademark flair in Binge. © 2009 - 2019 TFC International Ltd. Tous droits réservés.